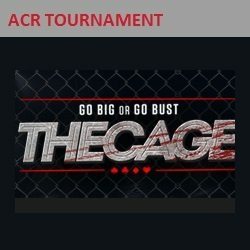 The Cage is a high-stakes tourney with a $1,050 buyin that’s the shining example of Americas Cardroom’s time-based tournament format. Play ends at at a specified time after which everyone who still has chips in front of them cashes out the chips for actual cash. The amount you make in this event therefore doesn’t depend on when you’re eliminated but rather how big your stack is when it ends. ACR recognizes that $1,050 is outside of the comfort zone for most of its customers, and it therefore offers ways for you to win your seat for much less. Those who achieve high rankings on The Beast and Sit & Crush leaderboards will receive entry into a $50 + $5 satellite that hands out entries to The Cage. Others can buy into these satellites for $50 + $5. Check out our Americas Cardroom bonus code description for full information on how to create an account and qualify for the welcome bonus. You need an account to play. Create one at ACR here!